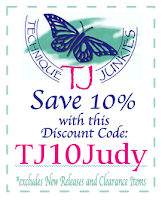 And now for an IMPORTANT announcement, if you place ANY order from Technique Junkies and you use the code TJ10Judy you will automatically get a 10% saving on your order! Please use this code when you place your order! This is a lovely Technique Junkie stamp called Horse - http://techniquejunkies.com/horse/. I used my Copic markers to color in the horse. The sky is sponged in. 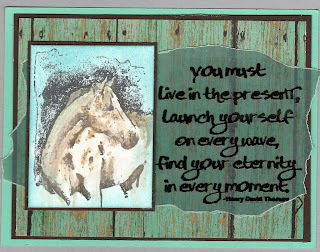 The verse is another Technique Junkie stamp called Live in the Present - http://techniquejunkies.com/live-in-the-present/. It was stamped with black Versafine ink on vellum, covered with clear embossing powder and heat embossed. I used my Xyron machine to add adhesive to the back of the vellum. I used a background paper that I thought looked like wood in a barn. Layers and sponging complete the card. I have an IMPORTANT announcement, if you place ANY order from Technique Junkies and you use the code TJ10Judy you will automatically get a 10% saving on your order! Please use this code when you place your order! The Aged Tiles technique (April/May 2009 Technique Junkie newsletter) is a good one to use with this Technique Junkie stamp called Travel Documents - http://techniquejunkies.com/travel-documents/. I stamped it with dark brown ink. 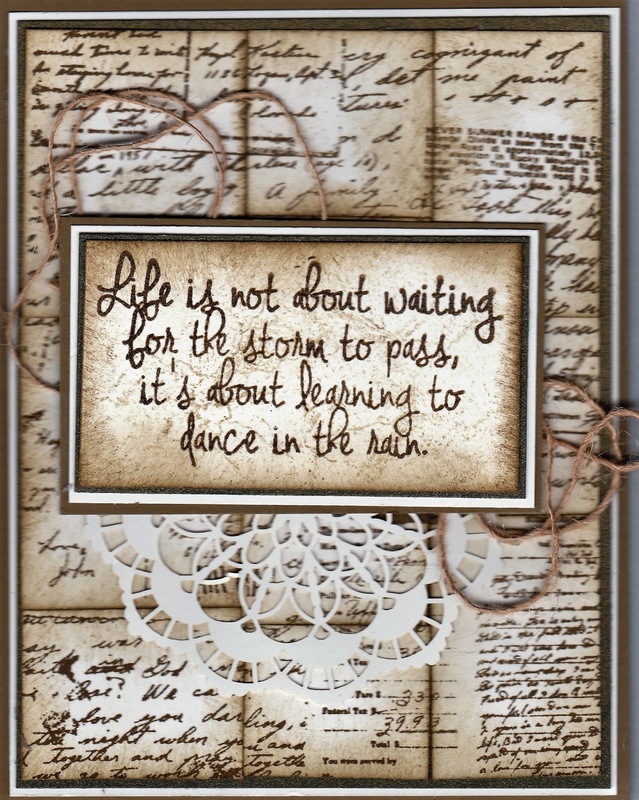 The verse is another Technique Junkie stamps called Dancing in the Rain - http://techniquejunkies.com/dance-in-the-rain/. It was stamped in a dark brown Versafine ink, and covered with clear embossing powder and then heat embossed. Sponging, layers, an off-white doily, burlap ribbon threads finish the card. This is another Technique Junkie March release called Love and Laughter Floral - http://techniquejunkies.com/love-and-laughter-floral/. It was stamped with Versafine black ink, covered with detail black embossing powder, then heat embossed. 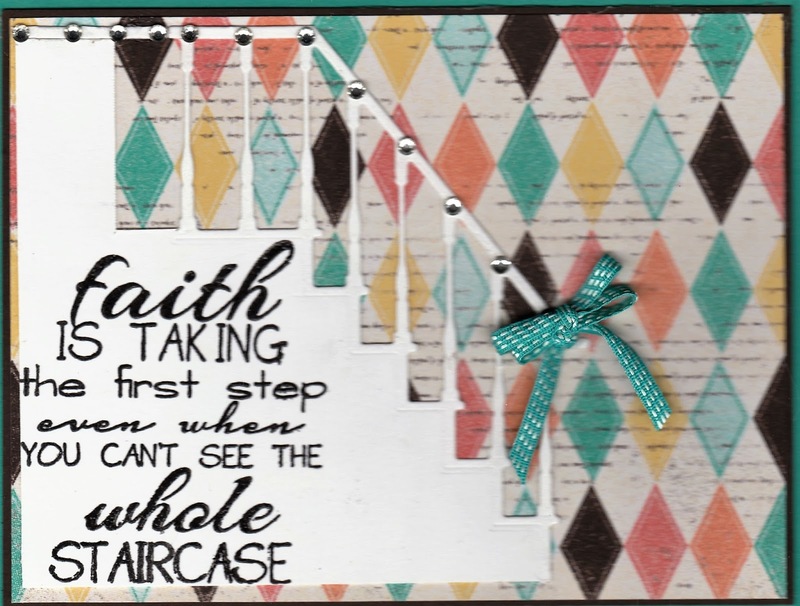 The background is created with a stencil and Art Anthology Colorations Spray - http://techniquejunkies.com/patience-colorations-art-anthology/. I used dye based markers to color in the floral stems. Then I added Diamond Glaze over each floral bud. I tied a bow with white organza ribbon and adhered it with a glue dot. I sponged a pale blue for the sky and then added fuchsia ink on the edges of focal panel with a sponge. This glittery card was created with the stencil Circle Mosaic - http://techniquejunkies.com/circle-mosaic-stencil/ - and Nuvo glimmer paste - http://techniquejunkies.com/nuvo-glimmer-paste-golden-crystal/. I tied a double bow and added a tiny gold and white bowl on top around the gold layer. The "Qeen" stamp is a Technique Junkie March Release stamp - http://techniquejunkies.com/queen/. I stamped her with black Versafine ink and heat embossed with detail black embossing powder. I added color with Twinkling H2Os and red lipstick (barely visible in the photo) with a Copic marker. I popped her up with dimensional tape and decided I was finished. Hope your day is great and get inky! To create this lovely spring card I used Technique Junkies Spring Daisies - http://techniquejunkies.com/spring-daisies/. I used black Memento ink and then used both Copic markwers and watercolors to add the color to this panel. The verse on the tag is called A Good Friend - http://techniquejunkies.com/spring-daisies/ - and is a wonderfully true thought. Good friends are are very real treasures. The verse was stamped with black Versafine ink and heat embossed with detail black embossing powder. I punched out the shape and several "ribbon tags" of both green and gold glitter paper. I adhered the "ribbon tags" with glue dots, and used several layers to finish the card. This fun giraffe stamp is one of the new Technique Junkie March release stamps called Watercolor Giraffe - http://techniquejunkies.com/watercolor-giraffe/. To make the tree leaves I used Technique Junkie stamps Something Will Grow - http://techniquejunkies.com/something-will-grow/ - being careful to only put ink on one side of the petals. 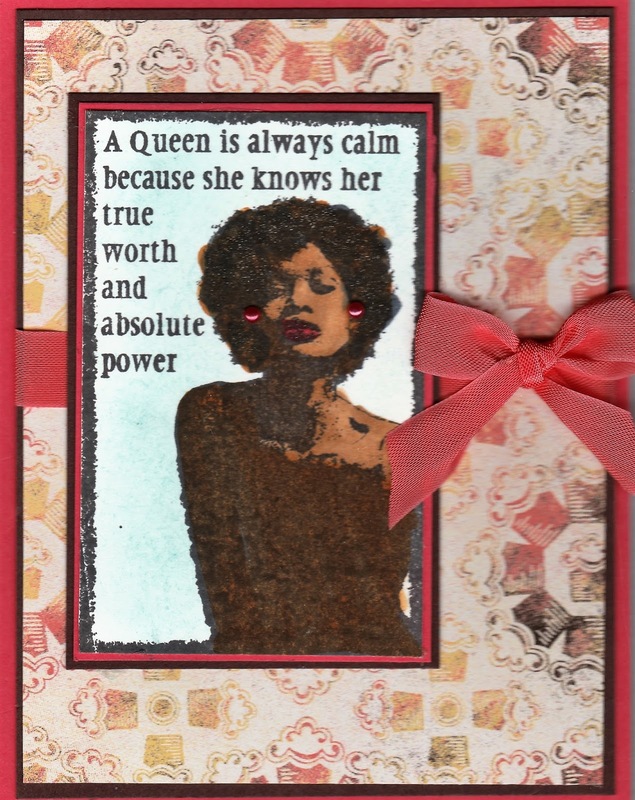 The verse is from the Technique Junkie stamp set called Mae West Sentiments - http://techniquejunkies.com/mae-west-sentiments/. 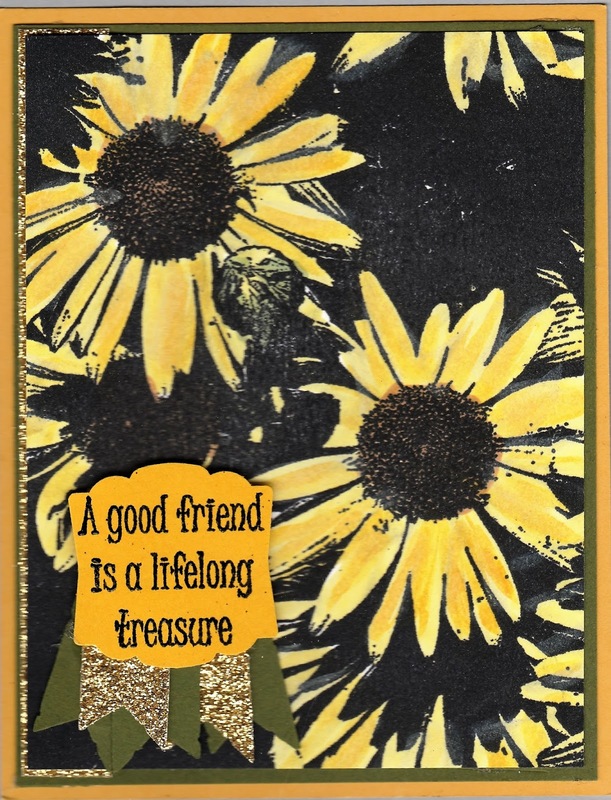 To create the background I used a mylar stencil and Art Anthology Colorations spray in yellow. 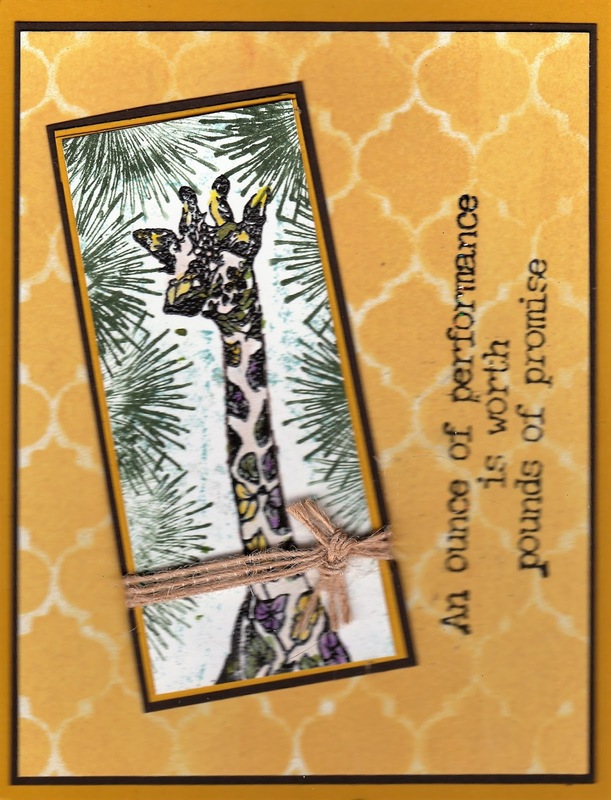 The giraffe was stamped with black Versafine ink and heat embossed with detail black embossing powder. Then I used Twinkling H2Os to add color. The verse was also heat embossed with detail black powder. I wrapped some burlap ribbon around the giraffe layer and tied a knot. Have a great day, and get inky! http://patstamps.blogspot.com/search/label/Stamp%20Conditioning . Stamp conditioning is VERY, VERY, VERY important when you are using a mostly solid stamp. It is difficult to get an excellently stamped image of a solid stamp without stamp conditioning. 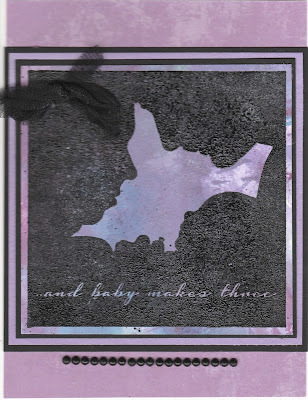 So tonight I remembered to condition this Technique Junkie March release stamp called Baby Makes Three - http://techniquejunkies.com/baby-makes-three/. I also used the MISTI to be sure I was getting a good dark image. /techniquejunkies.com/granny-smith-colorations-art-anthology/. An organdy bow finishes the card. If you have follow my blog you will know I have been very busy at my Florida home. Tonight was the first time I have held a stamp in my hand for weeks. 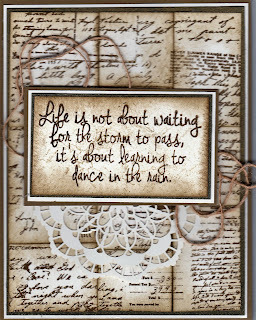 It will be another rainy day tomorrow so I will be stamping! This lovely card was created with a tag I made at the Technique Junkie booth at StampFest in New Port Richey, Florida in February. It used a stencil Pat sells in her Technique Junkie booth and on. line called Lite Brite Flowers Stencil - http://techniquejunkies.com/lite-brite-flowers-stencil/. We used Nuvo Mouse (only one of the available colors) - http://techniquejunkies.com/nuvo-mousse-lilac-lavendar/) and Art Anthology sprays (only one of the available colors) - http://techniquejunkies.com/avocado-colorations-art-anthology. Then I stamped the verse only from the Technique Junkie March release stamp called Love and Laughter Floral - http://techniquejunkies.com/love-and-laughter-floral/. To be sure I only inked up the verse since it is very close to the flowers, I cut between the two - leaving the same shape so I know exactly where to stick it back together on an acrylic block. The verse is stamped on pink vellum with Versafine black ink and heat embossed with clear embossing powder. I used Nuvo Crystal Drops to create the embellishment dots and swirls in the corner. I am so glad to be able to use my kitchen again. I have a pie baking as I type this. The kitchen renovation here in my Florida home is nearing completion. Hooray! This is the semi- finished view. There is one cupboard missing between the microwave and the over the sink cupboard. There was some miscommunication between me and the kitchen designer. Fortunately -- Lowe's accepted them back and I was able to get a refund on my credit card. And the correct size cupboard should be here on Thursday. A tile back splash is still to be installed as well as the door and drawer handles. 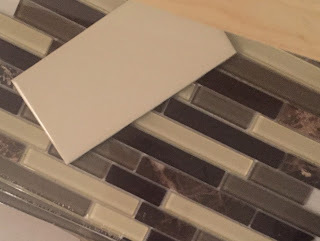 There will be 3 rows of the subway tile, then 3 rows of the accent tiles, then the rest will be in the subway tile. It will be pretty yet not expensive. The stove, microwave, and new refrigerator all work great. All three appliances are not the high end of their lines. They are all pretty basic. The refrigerator has no ice-maker or water dispense. It keeps thinks cold, and the freezer freezes things and doesn't make noise or leak inside. The counter top doesn't have a swollen bulge at the corner seam and doesn't stain with every spill. This is the half lazy-susan in the blind corner cabinet, which pulls out and swings around. It gives me full access to the corner where you cannot reach. It is a wonderful feature. This is the spice cupboard. It is a base cupboard and there is access to the spices on both sides. It is a nine inch wide cupboard. AddThis is the nine inch wide "cookie sheet" cupboard. It holds cookie sheets, and other baking pans. And here the first pie -- it is raspberry! And now things are out of cardboard boxes, the folding table is put away, and we can progress with the handles, and the back splash, and other things to finish up. And stamping can resume! Have a great day and get inky! I will be doing that myself! As I was going through my limited supplies here in Florida I came across this background paper. All of a sudden in my mind I could see the stairs to the side as Mickey is getting ready to climb up the stairs. And I used a new March Technique Junkie release Take the First Step. http://techniquejunkies.com/taking-the-first-step/ . 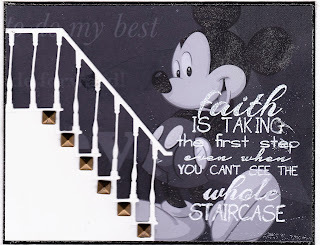 I stamped the verse over Mickey and heat embossed white embossing powder over white pigment ink. 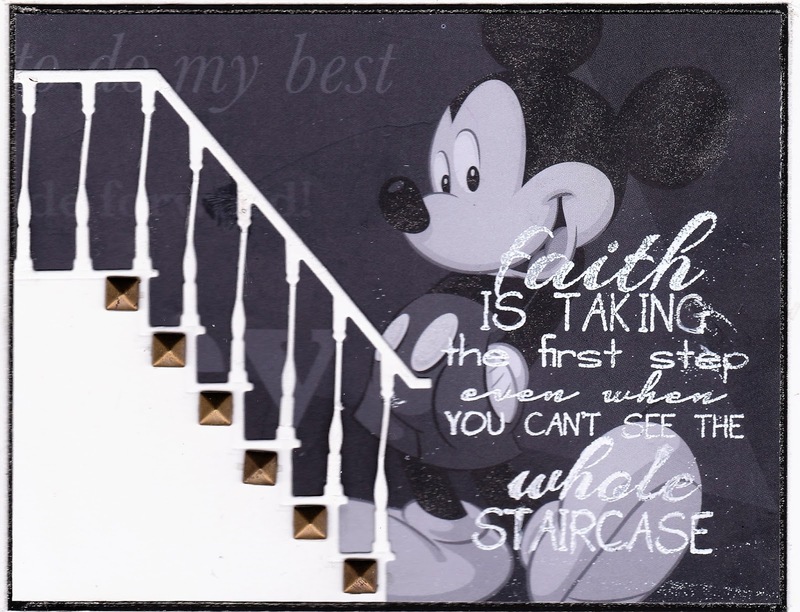 I die cut the stairs and adhered them to the left of Mickey. I added the little square studs on the stairs. I added all of this in layers to the base card. And then I looked at the card and decided it still needed something! So I decided to use my Wink of Stella pen on the darker areas of Mickey. It worked well. I am just glad the scan showed up well. So the wet, damp flooring has been replaced. New electrical outlets have run for both work on the counter, the refrigerator, and new under cabinets lights. And neighbor friends came and helped my handyman install the upper cupboards. Everything was going so smoothly you just knew there was going to be a problem, or two, or three, or so. Boom, first problem. One corner of one upper cupboard was cracked and the plastic corner protective thingie was clearly cracked so somewhere in transit this cupboard was dropped. This cupboard is 33 inches long. The next issue was that somehow, although I had taken in the correct measurements of 118 inches for the length of the cupboard on the sink wall, cupboards were ordered for 135 inches. So installation of upper cupboards was at a halt. And of course there would be cupboards that were too long for the wall on the base cupboard. I went to Lowe's to return two under cupboard lights and get the right sizes. And I wanted to talk to Haydee, my new kitchen friend! The return was easy, finding the right lights were a little more problematic and I need to return one more and get another motion sensor under cabinet light because the switch for the light is a rolling switch and where it is placed on the cord would be inside the cupboard under dishes or glasses. While I was at Lowe's my friends called to say the corner cupboard may not fit. And a chip is on the edge of the door of this cupboard. And I forget to tell Haydee while I am there. Haydee will come out this afternoon about 3:30-4:00. So installation of the lower cupboards was stalled. So my handyman, Burl, took his wife to get her perm, and came back. My neighbors went home. Burl's wife was done and he went back to get her. I come home, one neighbor comes in to update my on all that is going on here. And Burl returns. So I eat my lunch - everyone else has already eaten. Burl and I discuss the corner cupboard. I had already looked for the paper work on the new refrigerator being delivered in the morning and it is 32 inches wide not 33 inches wide. If Burl trims off 1/4 inch of the cupboard overhang, the new refrigerator will fit with 1/8th inch to spare! YEAH! So the corner cupboard is trimmed, and the sink base cupboard can be installed. Holes have to be cut to place the hot and cold water feeds and the sink drain. Burl has already moved the drain pipe slightly so it will completely fit inside the sink base cupboard. That is better than cutting into the corner cupboard to make the former placement of the drain pipe inside the corner cupboard. This way if there ever was a problem, then the drain pipe can be accessed easily and that is a good thing. The holes are cut, a neighbor and Burl lift the sink base cupboard over the pipes. I am on my hands and knees guiding the pipes through the holes. UH,OH! The holes for the hot and cold pipes is not big enough. So off goes the cupboard, and I go make a phone call I need to make. And I hear these words from Burl, "Oh no!!" I come out to discover the hot water pipe has broken off below the floor! But yeah, there is enough pipe below the floor to pull up and all will be OK! The holes are cut larger into one hole and i guide the pipes through. There will be something to plug that holes so various sundry Florida critters cannot have an open invitation from below my home to inside my home to party. Haydee comes and inspects everything. More measurements are take. Former cupboards are loaded in my car to be returned to Lowe's in the morning. And the correct cupboard ordered. So here is where I am at this point. One more weekend with no counter top and no kitchen sink. Burl will come in the morning sometime to hook the cupboard with the drawers to the sink base cupboard, adjust the 220 plug connection to the wall so it fits flush, and install the spice drawers to the wall. But I can start putting things in cupboard tonight. I borrowed a large cooler for cold stuff in the morning so the new refrigerator can be installed, and the old one hauled away. Next week the sink and counter top will be installed. the tip outs at the sink front installed, drawer shelves installed, the half lazy-susan installed in the corner, and perhaps the tile back splash can begin. Even though Burl is almost 82, he is in very popular demand as a handy man. And sometime next week another homeowner has 12 windows arriving for installation. So my kitchen saga will continue, and we wait for the 15 inch upper cupboard to arrive. So as you cook and work in your kitchen, think of me. Happy March! Happy New Stamps Day! Hooray! 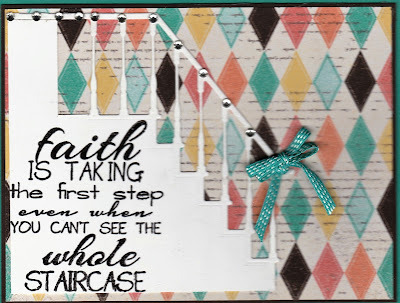 New stamp Blog Hop Day is always exciting to me. I know I have probably mentioned this before, but not all of the designers receive the same sets of stamps from Pat. We never know what each other has received. I have known Pat for many years. Pat has become a good friend to me. She knows me and she knows what stamps I would like and which ones I wouldn't like. Design Team Blog: http://techniquejunkies. blogspot.com. Then make sure hop the rest of the blogs. All of my stamps used today are from the Technique Junkie March stamp release you have gone through the hop! And they are all ON SALE 15% OFF THROUGH JANUARY 8! So get shopping after you have gone through the hop. My first card uses the Technique Junkie stamp Taking the First Step - http://techniquejunkies.com/taking-the-first-step/ . I stamped it with Versafine Black Onyx ink, covered it with clear embossing powder and heat set it. Then I fit the the stair case die around the image and die cut it the stairs. I put it a rhinestone at the top of each stair rail, and a bow at the bottom. My second card uses Technique Junkie stamp Baby Makes Three - http://techniquejunkies.com/baby-makes-three/ . I stamped it over and over with a stamp positioner to get the image as dark as possilbe. I stamped it on a piece of card stock with I made with the Antique Glimmer technique. It was in shades of purple so I felt that worked for a baby card. I sprinkled detail black embossing powder on the image and heat set. A bow, lots of layers, and some beads finish the card. My third card uses Technique Junkie stamp Queen - http://techniquejunkies.com/queen/. I stamped them image with brown Memento Ink. I went over her face, hair, and dress with Copic markers. Wink A Stella gave her hair and dress give those areas a delightful shimmer.I sponged in a light sky. Bead earings, layers, and a ribbon bow complete the card. 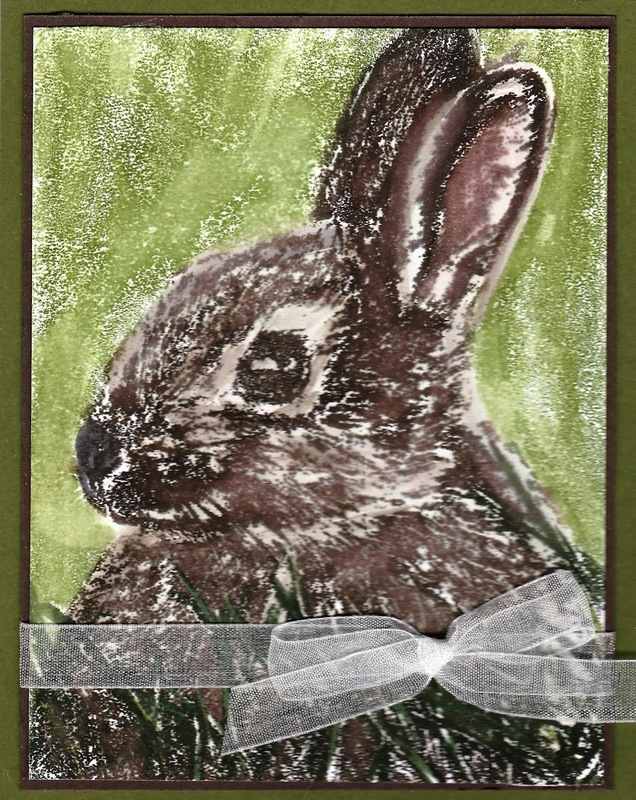 My last card uses one of my favorite stamps in this collection of new Technique Junkie stamps - Big Bunny - http://techniquejunkies.com/big-bunny/. I purposefully did not use a greeting on the front because bthis bunny could be used for a variety of occasions - birthday, Easter, Mother's Day, Father's Day, Get Well Soon, Thinking of you, and so on. To create this card I used a MISTI and used dye based markers to ink up small sections a bit at a time. I reinked and stamped over and over and over again. I changed marker colors using several shades of brown, coral, and greens. I did all of the browns fo the bunny first. Then I used a barely damp paint brush to move little bits of color without destroying the marker lines so they are still clearly seen. That technique still gives the bunny the depth and dimension he needs. Then I used several shades of green markers in the MISTI over and over a nd over again to get the depth of shading against the bunny's fur. I used the same barely damp brush on the grassy areas. I used Wink A Stella on the eyes, the nose, and to add a few highlights in the bunny's fur. A white organza ribbon and bow an layers finish the card. Judy Jackson: http://judysstampart. 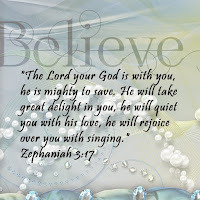 blogspot.com - You are HERE! Pat Huntoon: http://patstamps.blog spot.com - The next and last stop! Don't forget - all of the new March Technique Junkie stamps are 15% off though March 8! Get shopping, and get inky!